MinerBumping.com: Do You Have What It Takes? 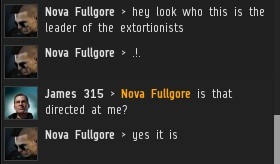 So, you think you're cut out to be an Agent of the New Order, eh? Let's find out. Every Agent-aspirant should know that it's not a job for the fainthearted. There are no floaters in the New Order. 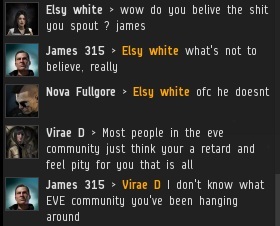 The entire EVE community will either love you or hate you. 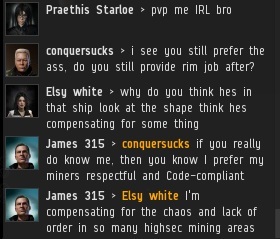 If you're going to rule highsec, you need to understand the people you're ruling. You need to make personal connections with them. 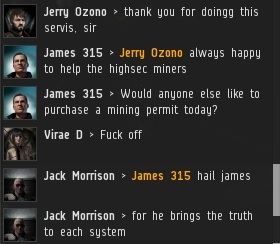 Highsec is a family. 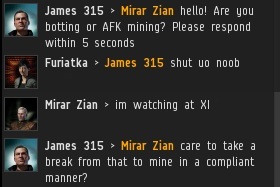 When you become an Agent, you'll have the most powerful team in highsec behind you. Don't be afraid to draw upon their resources to help you get the job done. 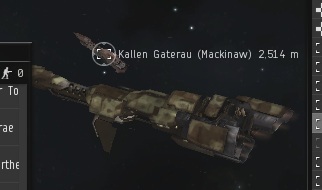 As the Father of the New Order and Saviour of Highsec, I'm the second-most famous player in EVE. Everybody knows me. 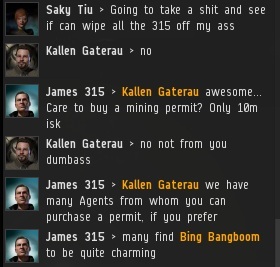 If you become an Agent, a lot of people will know you, too. Don't worry if you don't recognize everyone who knows you. It's their job to refresh your memory. Agents represent the accumulated body of all knowledge and wisdom in highsec. People will ask you a lot of questions, and they won't wait in line to ask you one at a time. Learn to multitask. Drag-and-drop character names into local chat to engage in multiple conversations simultaneously. 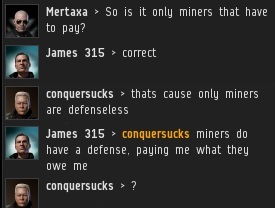 Every question or argument that a miner comes up with has an answer. You don't have to go far to find it: All the answers are always found in the Code. When you're enforcing the Code in a system, everything--every conversation, every person's comments in local--they all revolve around you. Like a star, an Agent is the center of the solar system. 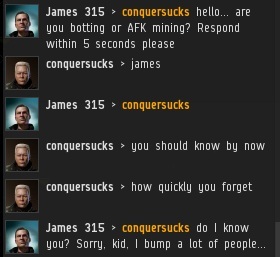 Don't be put off your guard when you encounter miners who think they know more about the New Order than you do. You're the expert; they expect you to correct them. Remind the rebel carebears how beneficial and compassionate the New Order is. They won't admit it, but they find it comforting to know that they're being defeated by the good guys. 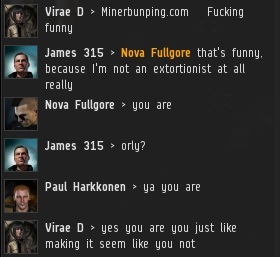 The New Order is a welcoming bunch. We gain power by inviting people in, not excluding them. 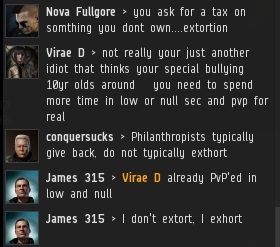 This is what distinguishes us from other elite PvP outfits. However, it's still important for new members to make a clean break with their dark past. The New Order is never arrogant. 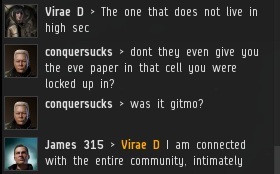 We're on good terms with the lowsec, nullsec, and wormsec communities. We merely expect members of those other communities to respect our laws when they come into our territory. When a rebel encounters the New Order, they experience something like the five stages of grief. First comes the denial and the anger, both of which are readily apparent. Don't forget to watch for signs that the rebel's attitude is softening--that they admit there is some good in what we do. When you see that, you're within striking distance of recruiting a new Agent of your own! I think the word you are looking for is 'awesome', not 'arrogant'. 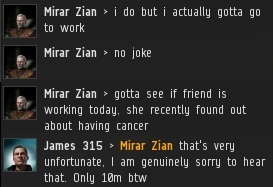 There is no more arrogant people in high sec than the miners who expect to do what they want without being affected by other players. They're called rebels. Lots of good lines in this post! I especially liked "Like a star, an Agent is the center of the solar system". 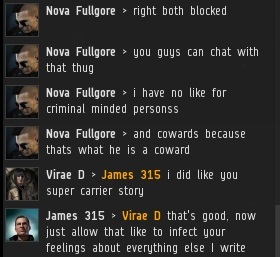 I also loved how Nova Fullgore called James a coward just before fleeing from confrontation by blocking him.